Former Ambassador to Iraq John D. Negroponte, right, shows honors to the colors as U.S. Marine Security Guards raise the U.S. flag on the grounds of the old U.S. Embassy in Iraq on July 1, 2004. 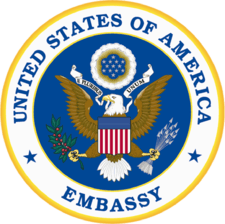 The Embassy of the United States of America in Baghdad is the diplomatic mission of United States of America in the Republic of Iraq. At 104 acres (42 ha), it is the largest and most expensive embassy in the world, and is nearly as large as Vatican City. Ambassador Stuart E. Jones is currently the Chief of Mission. The embassy complex employs 15,000 people and cost $750 million to build. The Embassy opened in January 2009 following a series of construction delays. It replaced the previous embassy, which opened July 1, 2004 in Baghdad's Green Zone in a former Palace of Saddam Hussein. The United States' Legation Baghdad was changed to embassy status in 1946. The building was designed by Josep Lluís Sert in 1955 and completed about 1961, with its main priority on keeping the building cool rather than security. This building remained the embassy until 1967, after the Six-Day War. The U.S. Interests Section was moved to the Belgian embassy in 1972; in 1984 this was upgraded to embassy status following the resumption of U.S.-Iraqi ties. Just days before the Gulf War, the embassy closed. The U.S. Interests Section was opened at the Polish embassy in 1991. The old embassy is now apparently deserted and for rent. It is located along the Tigris River, west of the Arbataash Tamuz Bridge, and facing Al-Kindi street to the north. The embassy is a permanent structure which has provided a new base for the 5,500 Americans currently living and working in Baghdad. During construction, the US government kept many aspects of the project under wraps, with many details released only in a U.S. Senate Foreign Relations Committee report. Apart from the 1,000 regular employees, up to 3,000 additional staff members have been hired, including security personnel. Two "major diplomatic office buildings"
The complex is heavily fortified, even by the standards of the Green Zone. The details are largely secret, but it is likely to include a significant US Marine Security Guard detachment. Fortifications include deep security perimeters, buildings reinforced beyond the usual standard, and five highly guarded entrances. On October 5, 2007, the Associated Press reported the initial target completion date of September would not be met, and that it was unlikely any buildings would be occupied until 2008. In May 2008, US diplomats began moving into the embassy. The embassy formally opened over a year behind schedule in January 2009 with a staff of over 16,000 people, mostly contractors, but including 2,000 diplomats. 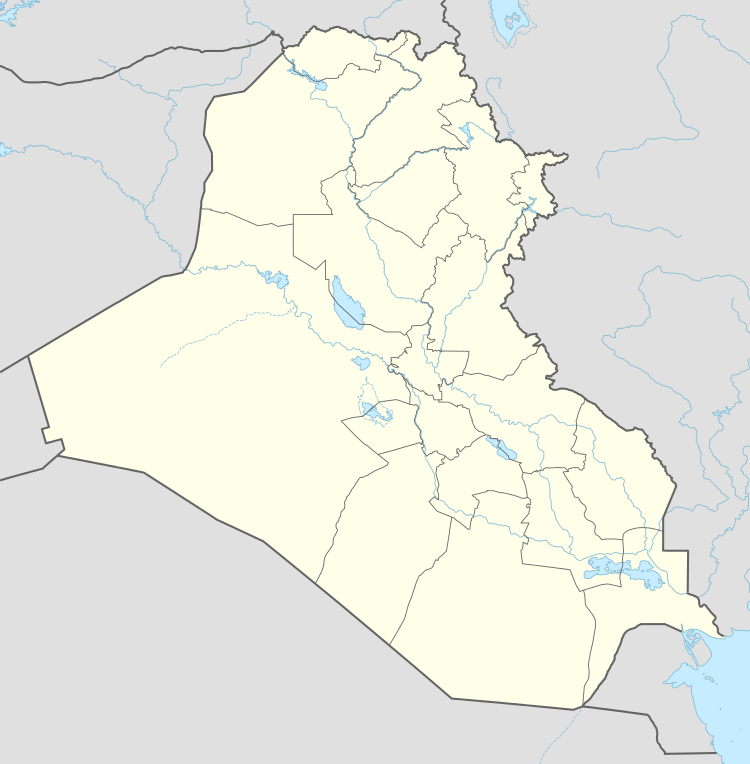 In February 2012, weeks after the final departure of US Military forces from Iraq, the State Department announced that the staff would be greatly reduced because of budget concerns and a re-evaluation of diplomatic strategy in Iraq, in light of the military withdrawal. There have been allegations of unethical practices and human trafficking by First Kuwaiti General Trading and Contracting Company, a contractor engaged during the construction of the new embassy. Embassy of Iraq in Washington, D.C.
Wikimedia Commons has media related to Embassy of the United States in Baghdad. ↑ "New embassy in Iraq a mystery". MSNBC. April 14, 2006. Retrieved November 3, 2010. ↑ Isenstadt, Samuel (February 1997). "Faith in a Better Future": Josep Luis Sert's American Embassy in Baghdad". Journal of Architectural Education. 50 (3): 172–88. Retrieved 2012-10-16. ↑ Kemp, Martin (May 23, 2007). "UK Guardian - "Diplomacy has no place in this monstrous bunker"". Guardian. UK. Retrieved November 3, 2010. ↑ Wall Street Journal, "Embassy in a Box: U.S. diplomatic architecture is increasingly dull"
↑ "Iraq". State.gov. Retrieved November 3, 2010. ↑ H.D.S. Greenway (November 8, 2005). "The atypical ambassador". Boston Globe. Retrieved November 3, 2010. ↑ Giant U.S. embassy rising in Baghdad, USA TODAY, April 19, 2006. ↑ Huge US Embassy compound delayed - CNN.com Archived October 10, 2007, at the Wayback Machine. ↑ "U.S. 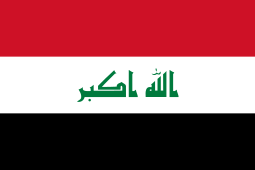 Ambassador to Iraq says embassy ready". USA Today. April 11, 2008. Retrieved November 3, 2010.